A little squirrelly fun for lunch. 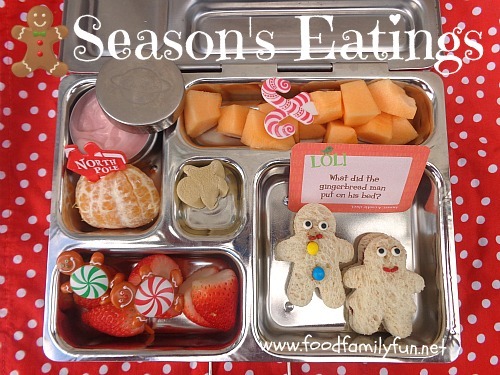 Amy has a boiled egg, honeydew melon and strawberry pieces, carrot sticks and a squirrel shaped ham sandwich with a bushy tail. The tail has a little peanut butter and chocolate spread with chocolate sprinkles. 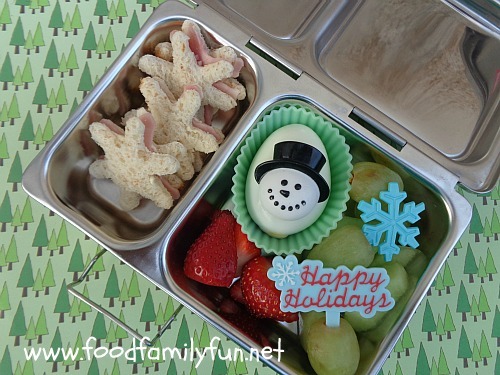 That was a really special treat to find in her lunch! Today, I am guest posting over at BentOnBetterLunches. How exciting! 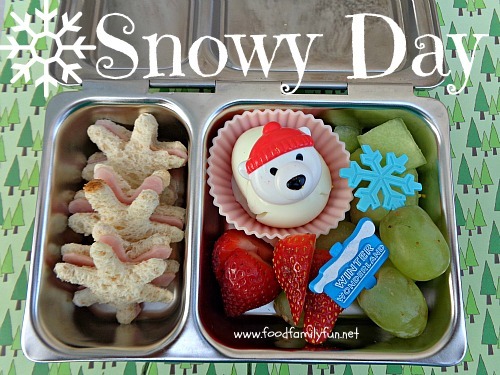 I've made two panda themed lunches and have shared one over there and one over here. 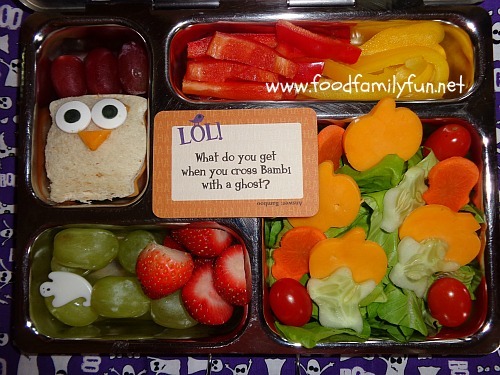 This is Rose's fun panda themed lunch. 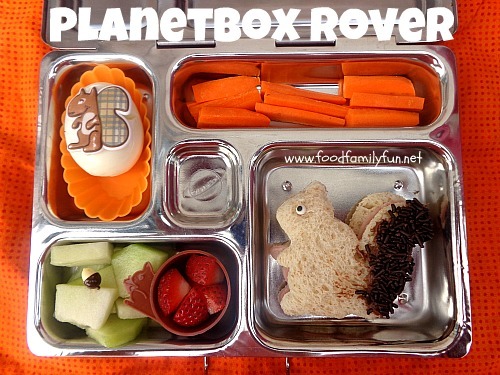 Rose has a panda shaped boiled egg, honeydew melon & blueberries, yellow peppers, carrot sticks and veggie dip. There is also a mini babybel cheese with a nori face to look like a panda (sort of! ha.) Rose has a special treat for her sandwich today - it's chocolate & peanut butter filling! She was thrilled at the suggestion. 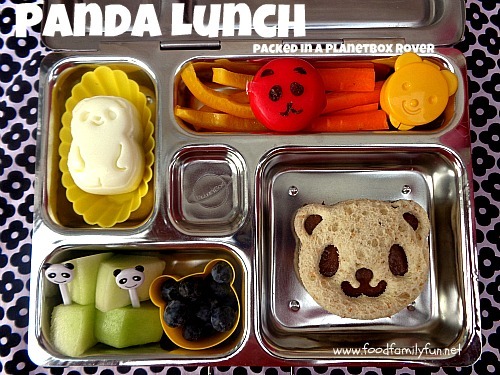 I'd love it if you pop over to BentOnBetterLunches to see Heidi's panda themed lunch. Hers is packed in a Planetbox shuttle and is slightly different. I'll give you a hint about one difference, she has 2 super cute mini panda sandwiches. Can you guess what I used to make them? 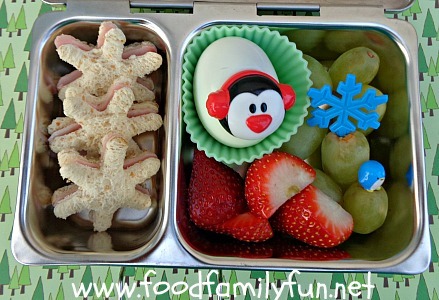 Here are some items that I used when making both panda themed lunches. There is a glorious amount of cute panda items available at Bento USA. Click here to see them all! It's been tricky packing lunch for Emily lately. She doesn't eat much and she's not been eating all of her sandwices. I made a batch of blueberry muffins and the kids were all happy to devour them! I saved a couple for lunches just to change it up a bit. Emily calls them cupcakes - I have not corrected her ^_^. 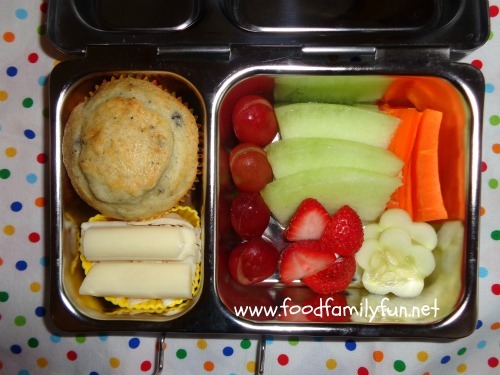 Emily has a blueberry muffin, rolled up turkey and string cheese, a couple of halved red grapes, a sliced strawberry, a few honeydew melon slices, 2 cucumber flowers, and a couple of carrot sticks. She took at least a few nibbles of everything. I knew that it was a bit too much food for her but I didn't want her to be hungry. Some days she eats everything in her lunch and when she comes home it's straight to bed for naptime. I want to make sure that if she's hungry at playgroup she has plenty to eat as she's just so tired when she gets home. Literally, she comes in the door and wants to take off her shoes and socks, grab her blankie and climb into bed. She's usually asleep within 20 minutes of arriving at home. Thank you playgroup! On those days I can get so much work done for my paying job. And that makes the nights earlier for me too. I am happy that she has such a fun time and a good nap - I just don't want her to be hungry but too tired too eat. She wakes up a bit grumpy sometimes and I'm sure it's beacuse she's a bit hungry. So I'll probably keep packing a little too much food just in case. This might just be my favourite mini sandwich cutter. It's sure had a lot of use since the start of the school year. 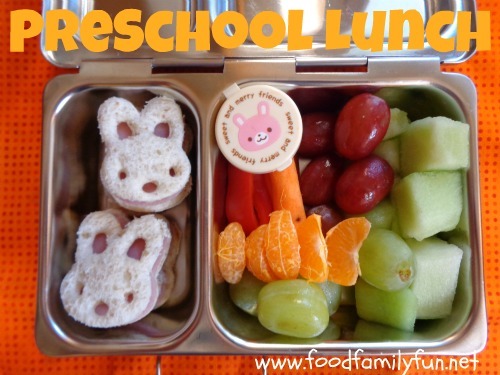 Here's a familiar preschool lunch for Heidi. Heidi has four bunny shaped ham sandwiches, red & green grapes, honeydew melon, carrot sticks, red pepper strips and ranch dip. 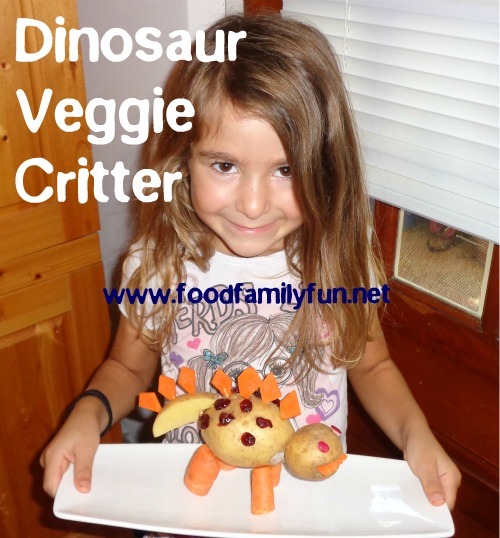 She hasn't really been eating any raw veggies except for carrots. She asked me to try some peppers so I put two small pieces in her lunch. She took a nibble but didn't eat them. Still counts as progess in my book! I'm a little tired of sending her carrots all of the time and she is going to get tired of eating them! I'd love to find a new raw veggie that she likes. We're on Mid-Term break here. Woo Hoo! No early mornings for a whole week ^_^. Last week got so busy that I didn't have a chance to blog many lunches. 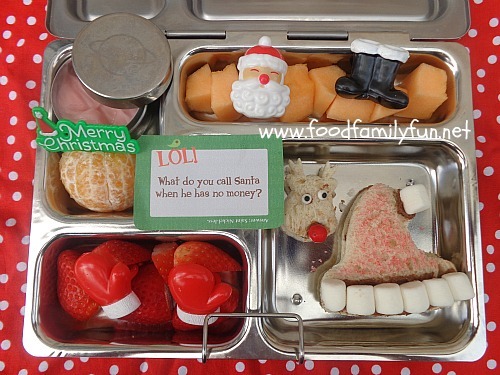 Here are a couple of funny face lunches that I made for Amy & Rose. Rose had veggies & dip, cantaloupe, pineapple. 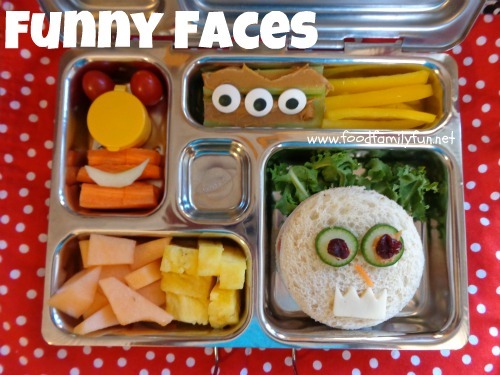 celery with peanut butter (and candy eyes), yellow pepper and a funny face ham sandwich. I went on a healthy eating grocery tour a couple of week's ago. I've changed a few things on in our diets, mainly in the reducing fat area. I get so focused on reading the labels for the carbohydrates and sugar when making decisions about what to choose that I forget to keep a check on the fat. I guess that's just from years of being PG and having TOTAL STRESS over my blood sugars. Well one change that we made was to switch to Bolthouse Farms salad dressing - their yogurt ranch is a hit with the kids and has only a fraction of the fat. Win! It's really tasty too, and I'm not even a Ranch lover. Amy's lunch is similar. 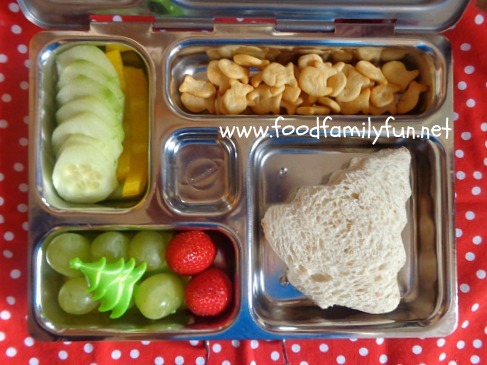 Way less veggies and crackers added. She's been pretty difficult with her food choices lately, we're getting back into our same lunch rut so soon into the year. Not sure what to do about it just yet. 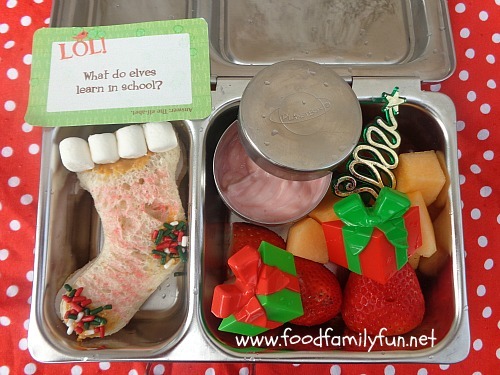 I'll likely experiment a bit over the break to try out some new lunchy items at home. She didn't like the new salad dresing - but she has yet to meet one that she likes. Also still not a salad eater, we're working on the deconstructed version first. 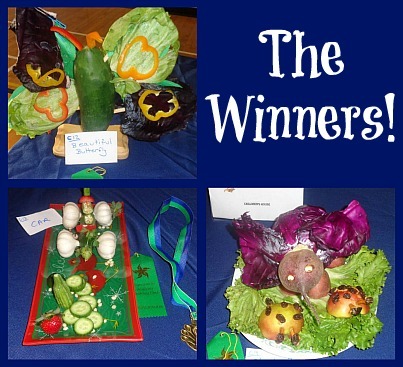 Last weekend was the Annual Budding Chef competition at school. All 3 girls entered again this year. The girls did not win in their categories this time, but they all got a participation ribbon. Heidi said, "We all got ribbons so we all won!" Love my little peacemaker ^_^. 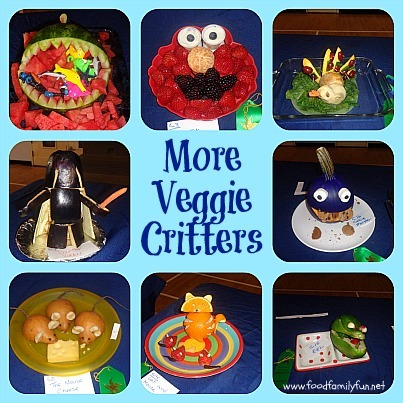 Rose & Heidi's age are allowed to enter the veggie critters competition. It's one category and all of the Children's House can enter so it's ages 3-6. I helped with both. It's really hard to push the toothpicks into the potatoes! There were lots of fun entries - it's a pretty tough category. Here are the ones that won. The car on the bottom left was first place, the butterfly was second place and the elephant with the lady bugs came third. 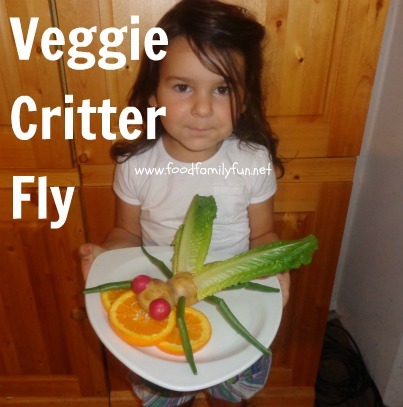 We spent a while thinking up and looking at other critters for ideas online the day before. We almost made that exact same elephant (I thought it would be easy for the kids - I really tried to convince them!) but they were not interested in making it. I also took a photo of many of the other entries. Here are a few. I'm partial to Darth Vader. Neat idea! Instead of a Spookie Halloween Lunch, I decided to make a happy one! Amy has a smiling Jack O Lantern sandwich today. 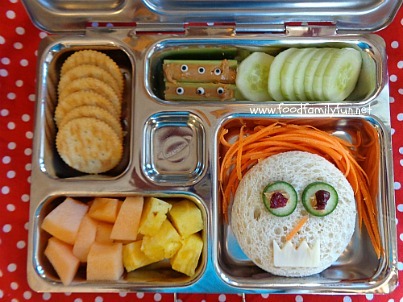 As excited as she was about her Spookie Ookie lunch, Amy didn't seem to eat much out of it. She was either rushed or not that hungry. 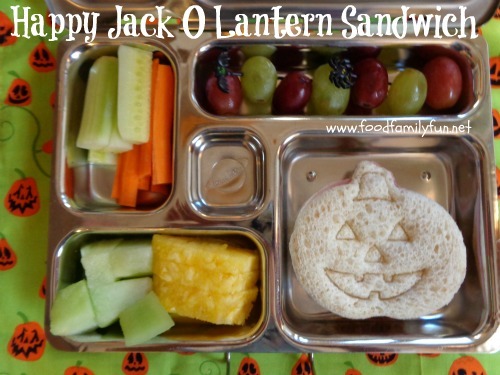 In this Happy Jack O Lantern lunch I packed many of Amy's favourite foods. Cucumber and carrot sticks, honeydew melon and pineapple and both reg & green grapes. Her Happy Jack O Lantern sandwich is a ham sandwich. She ate more out of this lunch, but still not very much. I think she must be very chatty at the lunch tables these days! Amy wanted a spookie Halloween lunch so this is what I came up with, a funky monster which looks sort of happy and lots of monster parts! 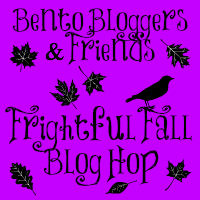 Today's post is part of a fun Frightful Fall blog hop by the Bento Blogger's and Friends. At the end of the post click the button to hop over to the next Frightful Fall lunch. 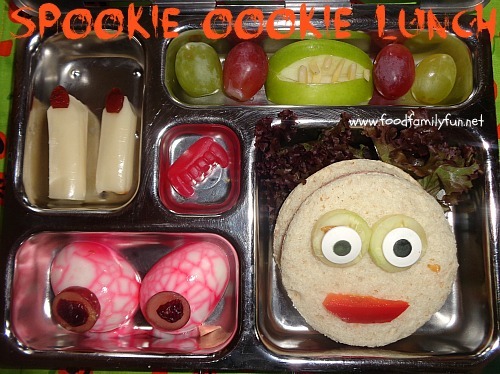 Amy has mozzarella cheese & fruit leather fingers, spookie boiled egg eyeballs with grape slices and dried cranberry accents, apple and almonds monster mouth and a few grapes. The gummy candy Vampire teeth are made by the Natural Confectionery Company. Amy's sandwich is a turkey sandwich with lettuce hair, cucumber and candy eyes and a red pepper mouth. Rose has a Haunted Pumpkin Patch Lunch. I packed her a Wadson's Farms baby butter lettuce salad with cheese pumpkins, ghost cucumbers, skull carrots and grape tomatoes. 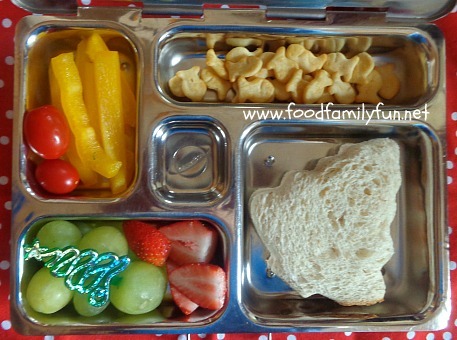 She also has red & yellow pepper strips, grapes, strawberries, a couple of grapes and an owl shaped cheese sandwich. This lunch is vegetarian. I packed her a lunchbox love note from the Halloween Jokes series. Amy also had one but it didn't make it into the photo. Her joke went something like this - What kind of fruit do vampires love? Neck-tarines. hahaha! So here's how the hop works. 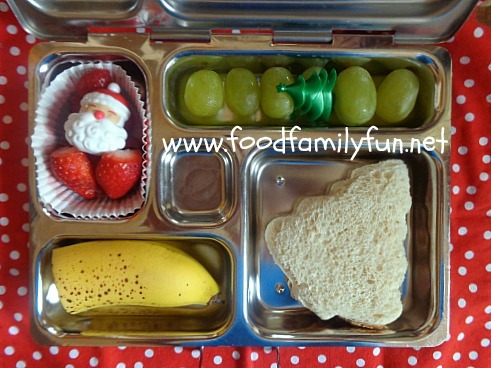 Click the button below to hop to Sarah's blog Zoe's Lunchbox. Keep clicking the buttons to see all of the lunches. When you arrive back here you will have seen them all. There are 15 different blogs. Since this is day 3 of the Bento Bloggers & Friends Frightful Fall hop, you can also go through the other 2 hops that went live earlier this week. Click here to start day 1, Click Here to start day 2. 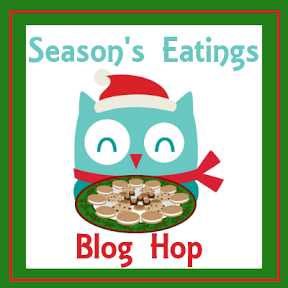 Each one will have 15 blogs so if you hop all 3 that's a total of 45 fun lunch blogs! You'll surely find lots of fun FallOWeen ideas ideas.